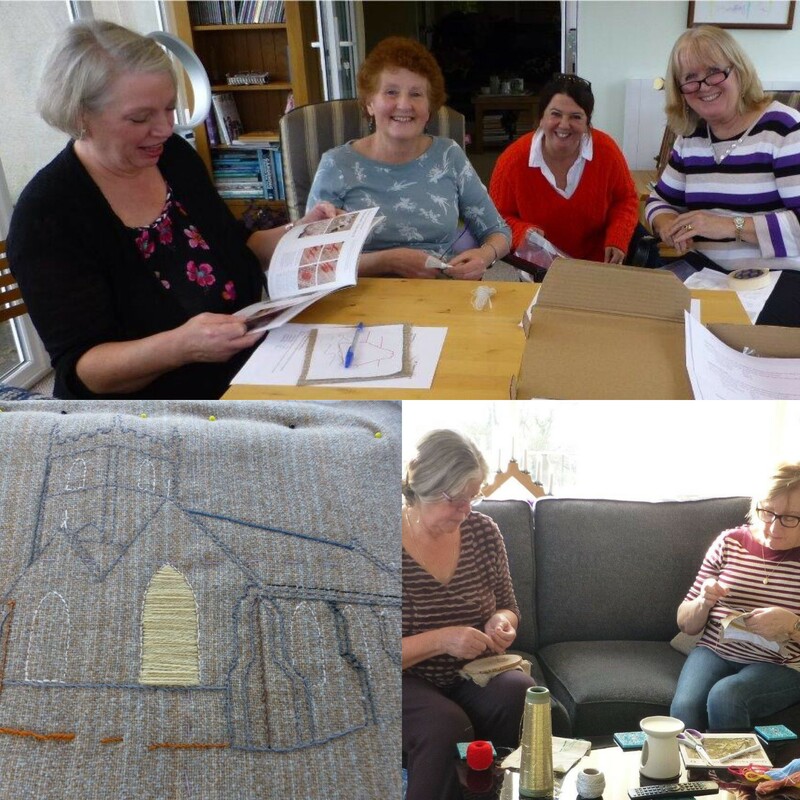 Flood Tapestry Workshop – The building was alive with productivity and a creative time was had at our second Flood Tapestry workshop, here at Quaker Tapestry, Kendal on 1st April. 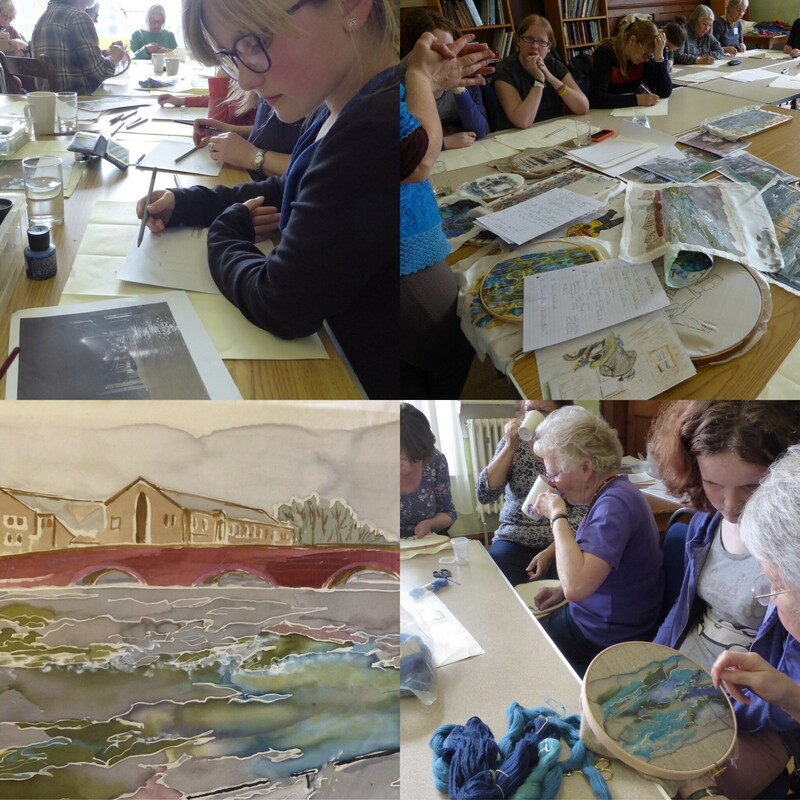 Led by textile artist Donna Campbell, who introduced herself and updated us with the progress of the project so far. During the afternoon we discovered why each of us was there – and this was for a variety of reasons. Some had been flooded, some had helped relatives or friends who had been flooded, some people were not directly affected but felt they wanted to be part of the project and share their memories of Storm Desmond. 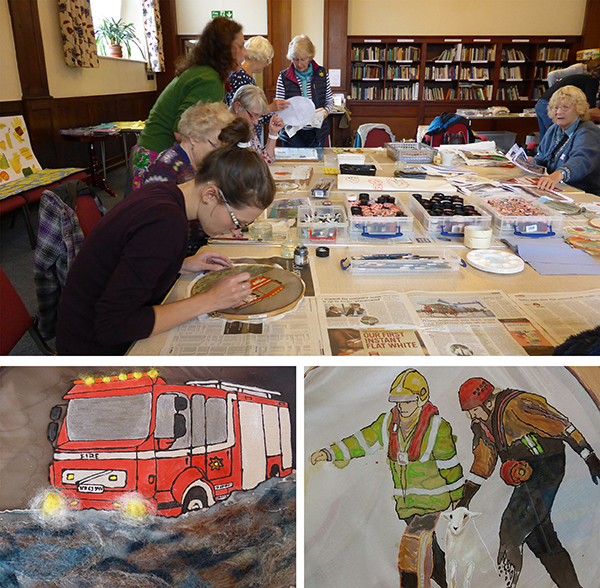 The Flood Tapestry Panel will be made up from the input of a wide range of Kendal’s communities. Donna shared artwork produced by a local Dementia group which will also contribute towards the final panel. They had created the most beautiful representations of some of the more memorable photographs published during the floods. By using fabric paints on stretched hoops of fabric they had captured the water logged memories of a community pulling together with astounding accuracy, bringing a colourful yet gently reflective aspect to such sad times. Some attendees who were keen to write, sharing their memories and feelings about Storm Desmond others were keen to draw and some were on with stitching. It was a hive of activity. All the materials and resources were provided along with refreshments and gentle encouragement. We had some experienced stitchers on hand to help guide those who were new to stitching, techniques were soon picked up and some great ideas were created. The children who attended were absorbed in their detailed drawings which will be valuable resources in creating the final piece. It was fantastic to see so many people spread over such a wide age range, from 7-70years, working side by side and all bringing their own unique take on what happened to the local community following the floods. We look forward to welcoming yet more eager participants at our next free workshop in the Easter holidays on 19th April at Sandylands Methodist Church, 10am-12noon. Once again, all materials will be provided along with refreshments and encouragement and it’s a family friendly event, open to all (children must be accompanied by a parent/guardian).